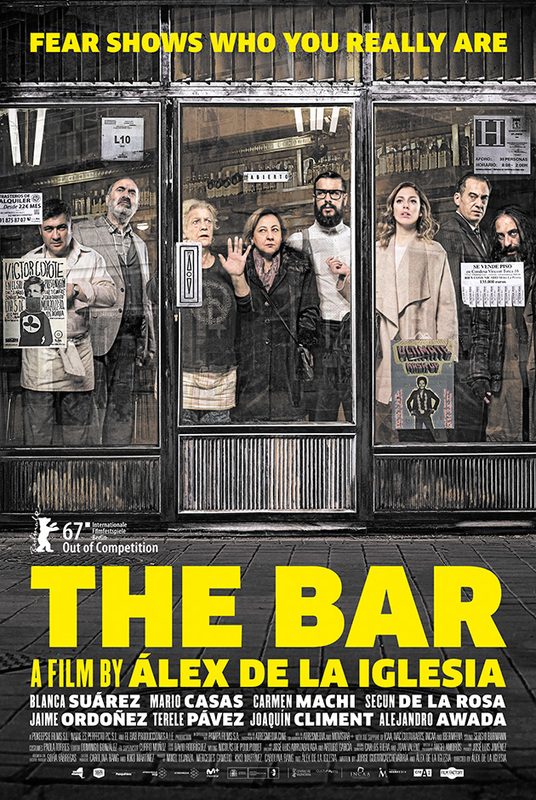 THE BAR is a disturbing, claustrophobic and frenetic thriller with the visual power that comes with an Álex de la Iglesia film. This renowned genre director took inspiration from Carpenter’s Assault on Precinct 13 and Buñuel’s Exterminating Angel, and sprinkled it with his own particular brand of black humor. A bar on an average day at mid-morning. Long-standing regulars and strangers sidled up to the bar, sharing fried pastries and grilled ham and cheese sandwiches. Life goes on as normal until one customer exits an dis shot in the middle of the deserted square. Inside, the group is stunned and only one of them decides to go out to help the downed man, promptly receiving a bullet himself. Everyone tries to come up with an explanation for why nobody inside goes out to help the fallen men: there could be a madman shooting from the rooftop. The square remains strangely empty and their phones have no service. Amid the confusion, they discover that someone removed the bodies from the square without them noticing. At that point, their speculations are unleashed, but soon one idea takes hold: What if the danger is inside?And what if the shots are to keep them from exiting the local and putting those outside in danger?